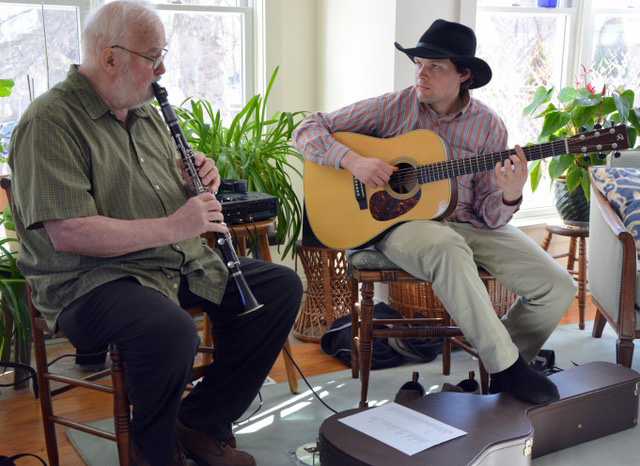 Jazz clarinetist Brad Terry will be joined by guitarist Peter Herman for a very special concert at the Village Coffeehouse of New Gloucester, 19 Gloucester Hill Road, New Gloucester, on April 20, 2019 at 7:30 pm. Brad Terry is a world renowned clarinet player and virtuoso whistler who has played with Dizzy Gillespie, Doc Cheatham, Buck Clayton, Red Mitchell, Buddy Tate, Elliot Zigman, Eddie Thompson, John Basile, Steve Grover and Lenny Breau. Terry has led jazz workshops and clinics in many countries, including the U.S. and Poland. Brad was inspired and mentored at a young age by his childhood neighbor, Benny Goodman. This is somewhat of a “homecoming” concert for Brad. Brad lived in the Historic Village District of New Gloucester in the early 1970’s. Via a serendipitous coincidence, the current owners of Brad’s former house in New Gloucester found his contact info during a renovation of their kitchen. Over coffee in the Village Store, Brad reminisced about his time living in New Gloucester when he housed youth from the Penobscot nation and taught at the Village School, an alternative high school in the barn at the Chandler House Bed and Breakfast. We couldn’t pass up this opportunity to invite Brad back to his former stomping ground to perform at this special concert. Brad and Peter will perform a variety of standard jazz tunes, and with their combined talents will likely surprise the audience with many spontaneous and harmonious new jazz creations. With Brad Terry’s more than 50 plus years of experience and Peter Herman’s huge talent as a guitar player, it is sure to be an evening of jazz extraordinaire.